Chant with joy the names of Keshava, Madhava, Govinda and Krishna which bestow eternal happiness. 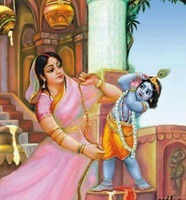 He is the lord of Radha. He is Hari who delights all. He is lotus-eyed with the complexion of dark cloud. He moves on Garuda bird. He wields the sword known as Nandaka in his hand. As Rama he destroyed the ten-headed Ravana. He is dear to Akrura. He holds the discus in his hand. He is serene yogi. He annihilated the demon Kamsa.